President Donald Trump has asserted that the FBI did not properly investigate Hillary Clinton’s missing emails. “Big story out that the FBI ignored tens of thousands of Crooked Hillary Emails, many of which are REALLY BAD,” Trump wrote on Twitter. “Also gave false election info. I feel sure that we will soon be getting to the bottom of all of this corruption.” Trump referred to a story highlighted on Fox News on Saturday that the missing emails from Hillary Clinton’s private server found on Anthony Weiner’s computer were not completely scrutinized by the FBI. 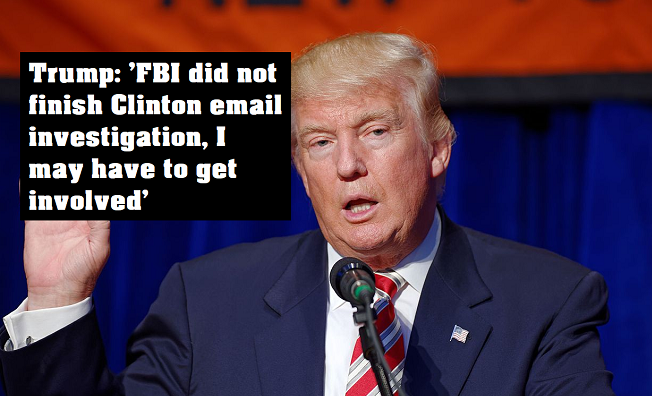 “The FBI looked at less than 1%’ of Crooked’s Emails!” Trump wrote, citing the report. According to Real Clear Investigations, only 3,077 of the 694,000 emails were directly reviewed for classified or incriminating information during the 2016 election after James Comey, the FBI director at the time, acknowledged their existence. Trump warned he might get involved in the investigation. ”At some point I may have to get involved,” he wrote. Image Author MichaelVadon licensed under the Creative Commons Attribution-Share Alike 4.0 International license. text added by MilneNews.com and not the original author.